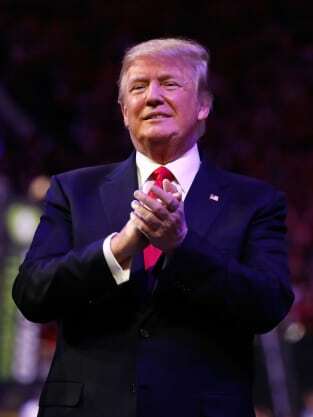 Donald Trump to Oprah: Bring... It... On! by Hilton Hater at January 9, 2018 2:55 pm . Donald Trump has heard the same rumors as you have. And, not surprisingly, the Commander-in-Chief has something to say about them. On the heels of a rousing speech at the Golden Globe Awards on Sunday night, the Internet lit up with talk of Oprah Winfrey running for President. According to various social media users, that is. After she inspired the nation with talk of female empowerment and equality, Winfrey quickly became the subject of talk among regular television viewers and experienced political pundits. Is she really considering a run for the Oval Office in 2020? Was the following speech her attempt at a stump speech? Was she thanking the Hollywood Foreign Press for bestowing upon her a major honor... or making a case that she is the most fit person to run the free world? Oprah herself has said nearly nothing about this chatter. Her close friend, though, has not dismissed the possibility. "I do think she's intrigued by the idea. I do think that. I also know that after years of watching the Oprah show, you always have the right to change your mind. "I don't think at this point she's considering it. But listen, there are people who have said they want to be her campaign manager, quit their jobs and campaign for her. "She loves this country and would like to be of service in some way, but I don't think that she's actively considering it at this time." 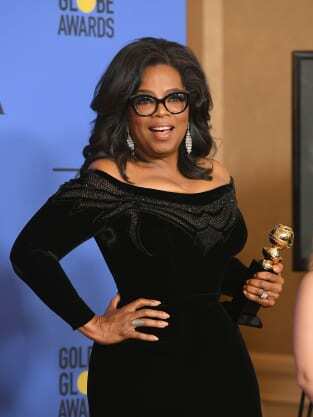 Winfrey became the first black woman to receive the Cecile B. DeMille Award at the Golden Globes. She's as respected as any celebrity on the planet. In other words: she's the antithesis of Donald Trump. So, would Trump be concerned about Oprah as a potential opponent in 2020? He was basically asked this question on Tuesday afternoon. Of course. What else is going to say? We don't even mean that as a typical Donald Trump diss. It's just, what would any sitting President say about a future opponent, that he or she may defeat him or her? Way back in 1991, interestingly, Trump said he would select Oprah as his Vice President, were he ever to run for President. Fast forward decades later and he went with Mike Pence instead. Oprah, meanwhile, has admitted that Trump getting elected does make her rethink whether she would have a shot at the White House down the line. “I thought, ‘Oh gee, I don’t have the experience. I don’t know enough. I don’t…’" Winfrey told Bloomberg Television last year. Oh, oh, as in: Vote for O, Vote for O? Click on the poll above and chime in: Would would you prefer as President, Donald Trump or Oprah Winfrey?